For over 140 years, General Electric made a brand promise to America that they would “bring good things to life.” While that slogan has retired, it continues to ring true for its philanthropic arm, the GE Foundation, and what it have helped to accomplish in NYC public schools over a decade. The GE Foundation first partnered with the Fund for Public Schools in 2004 with a $300,000 gift in support of the Leadership Academy. Since this initial investment, the GE Foundation has generously contributed over $37 million toward the success of NYC students through programs like the Greatest Generation Scholarship, Campaign for Middle School Success, STEM integration across curriculum, and support for college and career readiness of all NYC students. The two programs that the GE Foundation currently supports—STEM Institute and NYC Skills Lab—bring a new level of thinking to NYC’s public schools. The GE Foundation has enabled the NYC Department of Education (DOE) to remain nimble in response to learnings from program implementation, and to teachers’ evolving needs to prepare young people for college and career success in the 21st century. The GE Foundation’s investment in the DOE’s STEM Institute began in 2015, and since that time, has held six multi-day institutes to serve over 3,350 PK-12 educators from across NYC’s five boroughs. The program has demonstrated impressive reach and influence over STEM-related efforts across the system. “Our common ground has been aligned on the Chancellor’s priority, to focus on STEM,” said Kelli Wells, executive director of education and skills at the GE Foundation. “Technology is moving fast, the world is moving fast, and it’s changing. We need to help students be successful in their field. These are going to be the pioneers, the innovators, the dreamers, and the creators for what we’re going to be seeing in the next 20-30 years and beyond.” The most recent STEM Institute held in fall 2017 featured a keynote discussion between Neil de Grasse Tyson and Chancellor Fariña which underscored the urgency to bring quality STEM education to all NYC students. The Fund strives to facilitate meaningful partnerships for NYC schools that not only provide direct support, but an opportunity to improve and deliver quality results to students. Work begins with seed funding that promotes innovation, provides data that can be analyzed to see what works and what doesn’t, and lays the groundwork to scale solutions as broadly as possible across 1,800 city schools. GE’s support of STEM Institute is exemplary of this approach. Support from the GE Foundation in STEM Institute has made partnerships possible between the DOE and 65 external STEM organizations to directly support teacher practice. The DOE’s STEM Department has also become actively involved in both local and national networks, including the NYC STEM Network (a network of over 40 external non-profit organizations in NYC), and the STEM Ecosystem Community of Practice (a national network of 27 STEM ecosystems that include multiple partners). 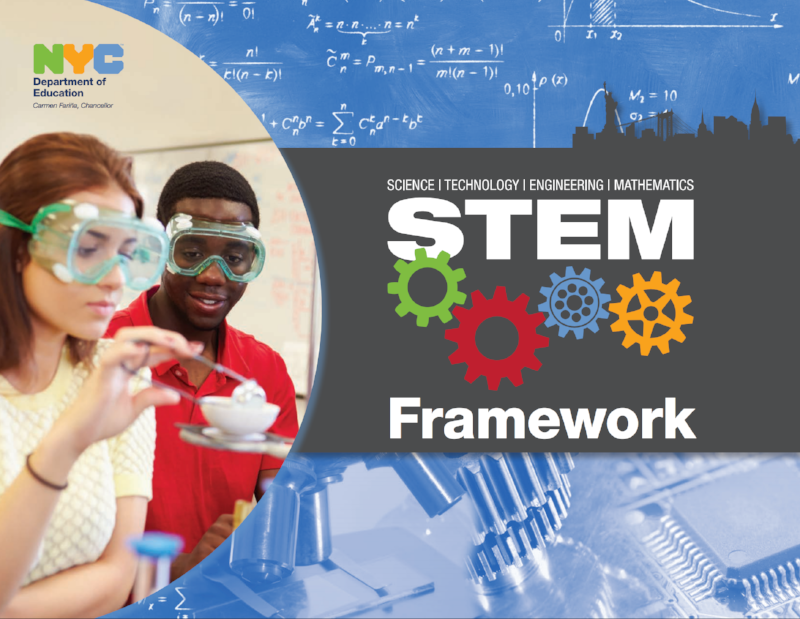 As part of this investment, DOE has developed and disseminated the STEM Framework to all DOE schools, which has led to development of the DOE’s first STEM Handbook, intended to foster broad adoption of best practices in teaching STEM subjects and tools for direct implementation. The Framework presented in the Handbook reflects a series of domains, indicators, and criteria to support the evolution of a school’s initiative over time. These landmark resources are designed to work alongside other data and qualitative tools to help schools develop a STEM culture that integrates well with a school’s existing instructional mission and vision, while shifting toward instruction and learning that ultimately spans across disciplines. STEM Institute has also catalyzed the development of NYC’s Summer in the City STEM program, which provides over 200 teachers with targeted training in teaching engineering, coding, and robotics in the summer school environment. The GE Foundation has supported the NYC Skills Lab since 2015, which has demonstrated success over the past two and a half years of implementation. NYC Skills Lab expands the quality and quantity of 21st century skill building experiences that prepare students for success in college and career pathways. Focused on integrating these skills into formal and informal programming, Skills Lab enhances adult capacity to provide constructive skills-based feedback, and deepened partnership, alignment, and collaboration among educators, and employers. A core set of easy to understand 21st century skills, organized into domains called the Building Blocks, are what make up the program’s framework and are intentionally written to serve as both learning objectives and assessment items. Each building block contains a targeted set of detailed skills like personal mindset, planning for success, social awareness, problem solving, and collaboration. Over 1,000 students have participated in Skills Lab, and they report that they are gaining confidence from practicing 21st century skills in their classes. They are less dependent on their teachers throughout lessons, and are able to demonstrate greater independence in successfully solving problems. NYC Skills Lab has supported over 30 Skills Fellows to work collectively to implement these building blocks into curricula in customized ways across the system. These fellows have been recognized for initiating transformative approaches at their schools. In fact, one in particular received a 2016-17 Superintendent Award for implementing integrated instruction that increased student autonomy and student-centered learning. As NYC Skills Lab and STEM Institute close out a final year of private support in the 2017-2018 school year, each program remains is integrating with other priority DOE initiatives. Over time, each is gradually transitioning to sustainable, public funding sources. The Fund and DOE are deeply grateful to the GE Foundation for its generous support for NYC’s leaders, school communities, and students. The impact of the GE Foundation’s longstanding thought partnership and investment in NYC will continue to reap great reward for years to come.